Jessica Harris is a dancer, educator, and Movement Pattern Analyst based in Brooklyn, New York. 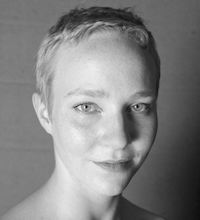 As a dancer, Jessica is a founding member of Shen Wei Dance Arts and has danced with the company for more than ten years. Performances with the company include the Lincoln Center Festival, Kennedy Center, Sydney Opera House, Walt Disney Concert Hall, La Fenice in Venice, Het Musiztheater in Amsterdam, Hong Kong Grand Theater, Sadler’s Wells and more. Jessica joined Shen Wei in choreographing material for the Opening Ceremonies of the 2008 Beijing Olympics. She has continued performing in a variety of projects, including Marina Abromavic’s MOCA Gala in 2011 and with her company, Oracle Acts, providing interactive event entertainment. As an educator, Ms. Harris has taught numerous dance and performance workshops throughout the US and Europe, and served a one-year teaching appointment in the Dance Department at Pomona College where she introduced a course in Site Specific Performance. She also developed a curriculum to teach cognitive skills to young children using movement, which she teaches in preschools throughout Brooklyn. As a Movement Pattern Analyst, Ms. Harris decodes movement to see how individuals and teams make decisions. Her company, Decision Harmony, works with professional teams and individuals to optimize their decision-making process. Ms. Harris received a self-designed Masters Degree in Experiential Marketing and the Experience Economy from the Gallatin School of Individualized Study at New York University as a recipient of the Jack Kent Cooke Graduates Arts Award.